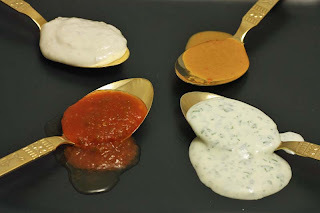 Here are some sauces and dips I made to accompany the chickpea chips and fries. Delicious as it was, the only one that did not work well with the chips was the Horseradish cream. I think it would compliment roasted winter vegetables much better. The other three were excellent. The coriander and soured cream was cooling and refreshing. The Jalapeno Tomato dip both sweet and spicy. I will certainly be making it again. I think it would be great with tortilla crisps and finally the Mojo sauce. The Mojo sauce was the hottest. Cut the chillies in half and remove the seeds. Rinse them under cold water, then cut them into pieces. Blend all the ingredients either with a handheld blender or blending machine. If the sauce is to thick, adjust with a little olive oil and vinegar. Blend all ingredients in a blender. Season with salt to taste. Those sauces sound yummy :). I love sour cream, so the horseradish & coriander ones definitely look great to me ;). That jalapeño tomato dip sounds so very tasty. I think I could just eat that off the spoon. Thanks. I used a jar version here, as I have great difficulty getting the fresh.